I had toured all through northern Sudan and as all roads in this desert state lead to Khartoum, it was time to see the capital billed as the hottest major city in the world. 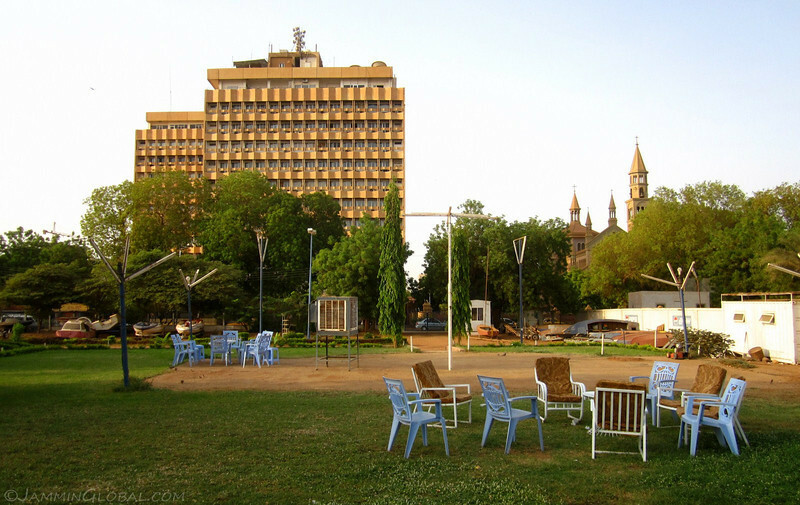 Khartoum sits at the confluence of the Blue and White Nile and is relatively modern compared to the rest of the country. 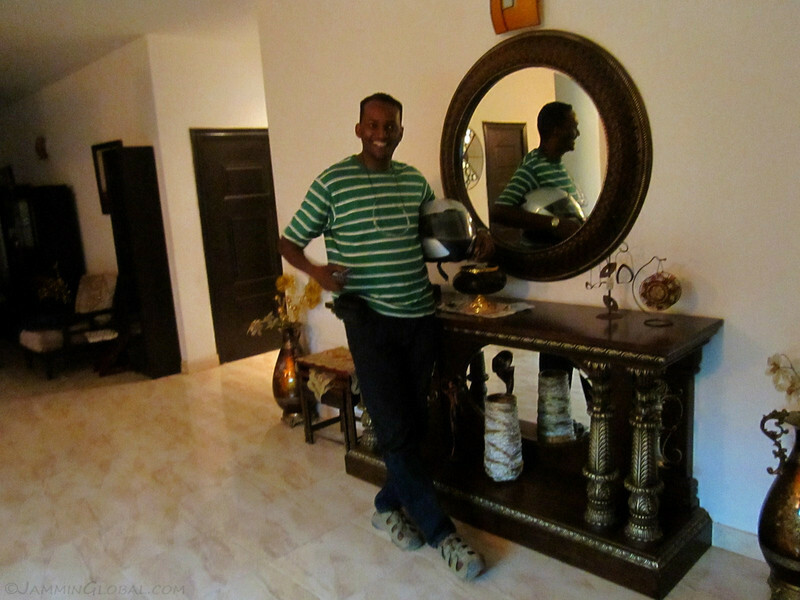 My main task here was to do some bike maintenance and get my Ethiopian visa. 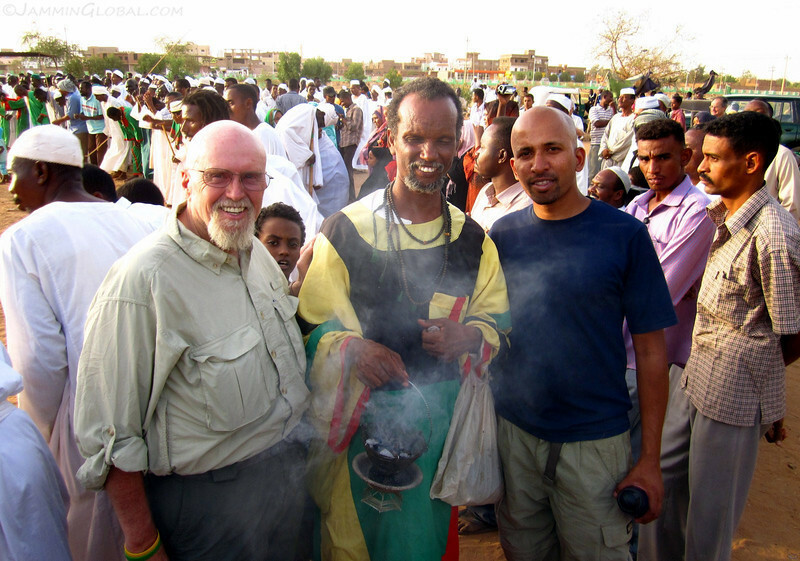 I met up with local biker Omer and another traveler, Tom, and we explored some of the cultural sights of the city. 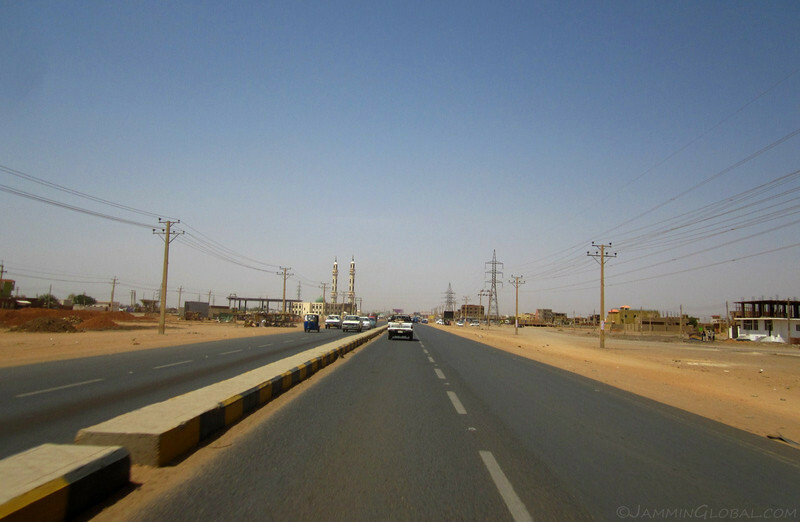 After spending the last few days out on the open desert highway, I had to switch into urban-riding mode about 40 kms (25 mi) from Khartoum. The road split into dual-carriages and I welcomed the concrete median, which meant no more crazy on-coming traffic. 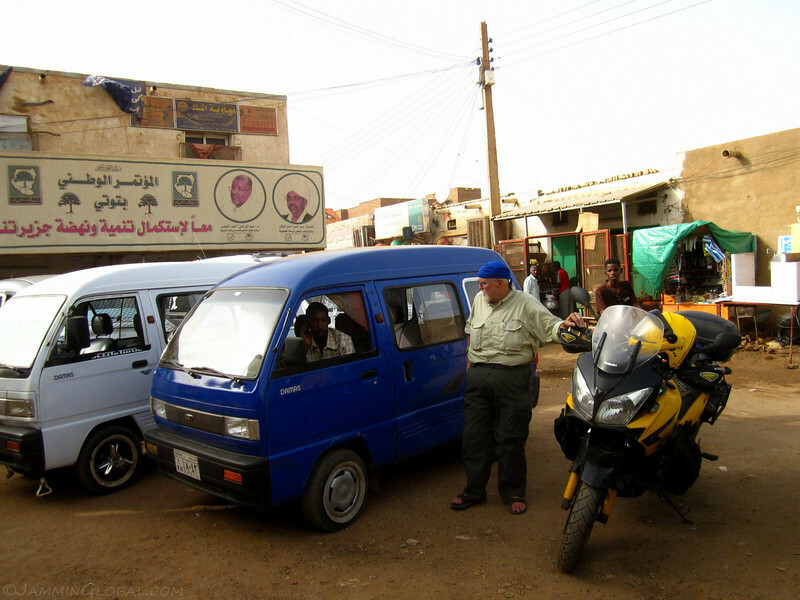 Khartoum doesn’t have that many affordable lodging options, so I opted for the overlanding junction of the Blue Nile Sailing Club. It’s an old establishment that’s been friendly to overlanders, allowing us to camp for the moderate fee of SP 25 ($11.30) per night. 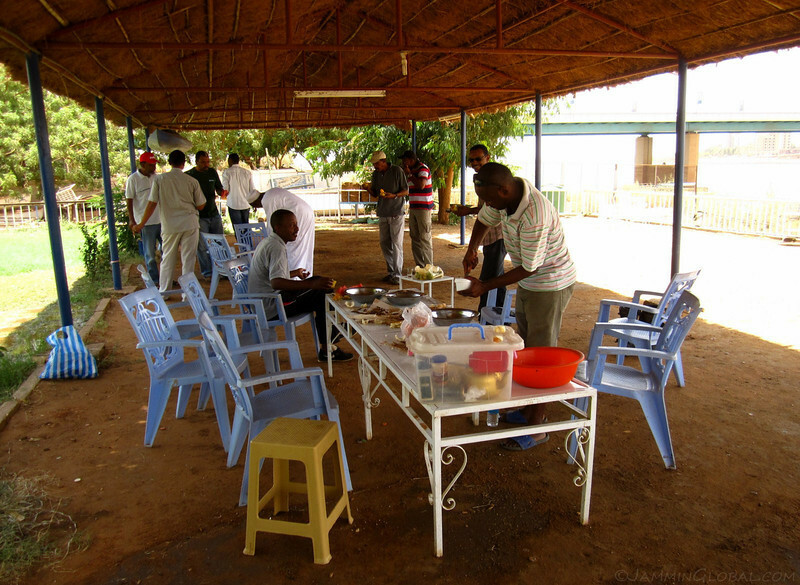 I was lucky to show up on a Friday as that’s when all the local club members meet for a brunch and the Sudanese being such welcoming people invited me to join them. There was the staple fuul (mashed fava beans) with bread, salad and fresh fruits. In the afternoon, another traveler showed up. This is Tom Richardson and he’s been riding this Suzuki V-Strom from South Africa and he’s heading for Europe. Crazy man, he started riding motorcycles at the age of 62 and soon after toured around South America and now at 70, he’s riding through Africa. It just goes to show, you’re never too old to welcome the joy of motorcycling into your life. 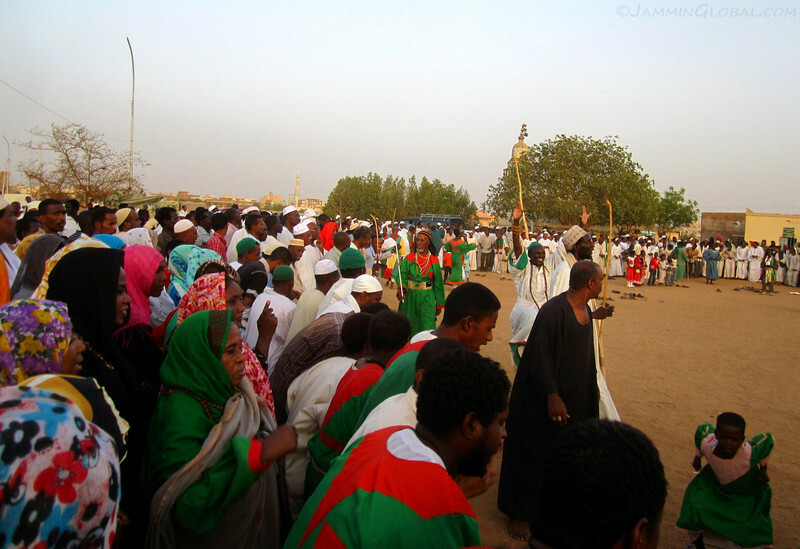 On Fridays in Khartoum, there’s a special weekly cultural event and Tom and I are asking for directions on how to get to the site in Omdurman. 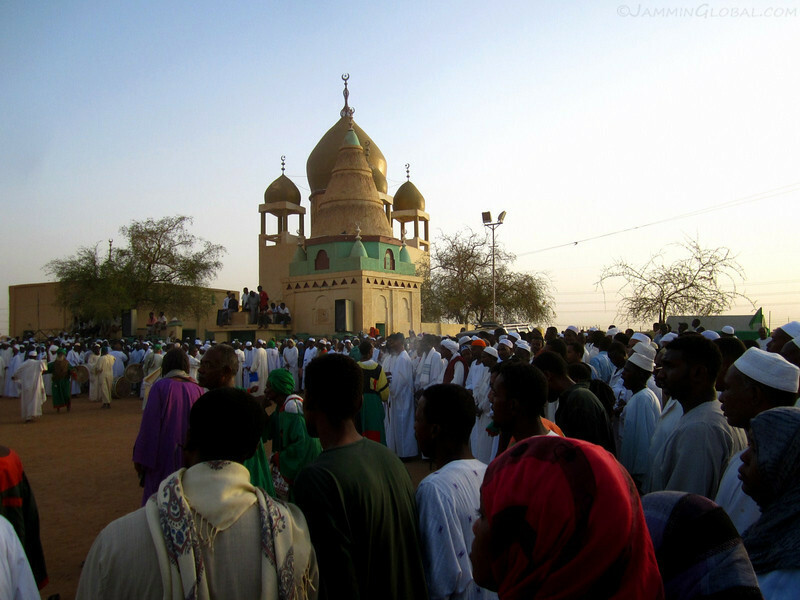 The greater Khartoum area is made up of three cities that are demarcated by the confluence of the Nile. 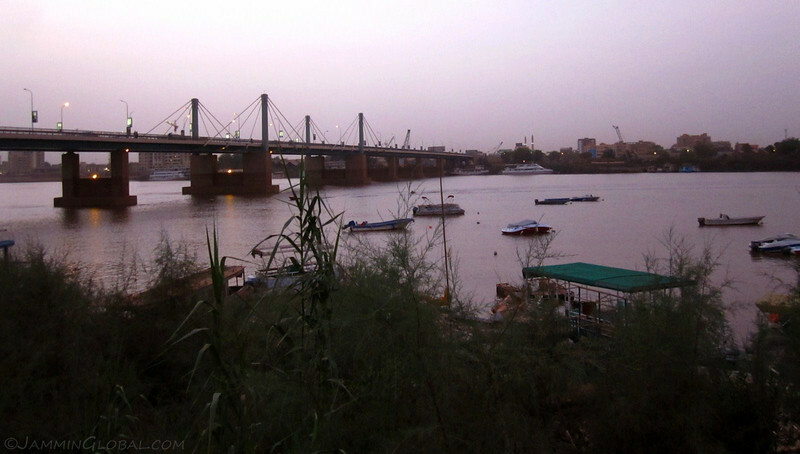 The White Nile flows from the south and the Blue Nile flow from the east with Khartoum proper below this intersection, Khartoum North on the north side of the Blue Nile and Omdurman on the west bank of the White Nile. 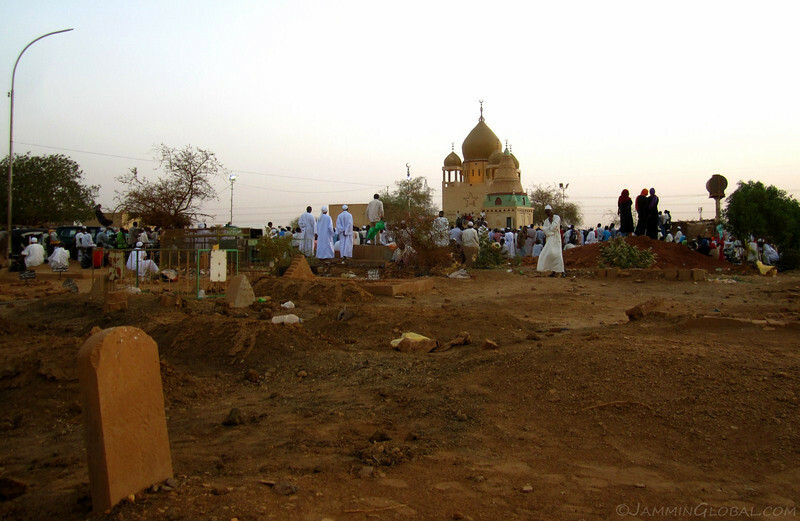 We arrived at the Hamad al-Neel cemetry for the start of a weekly Sufi zikir, a ritual involving dancing and chanting. Members of the Sufi Order of al-Qadiriya gathering next to the mosque that houses the tomb of the order’s founder, Sheikh Hamad al-Neel. 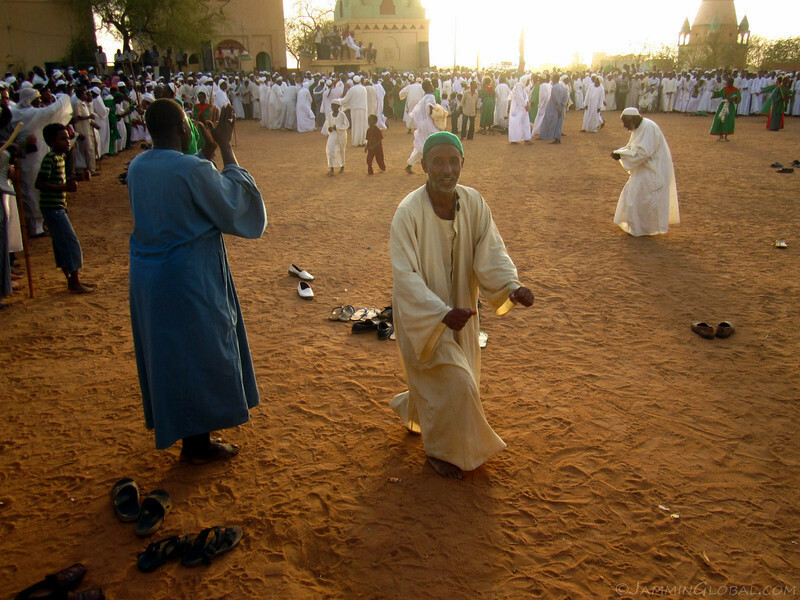 Like Sufis elsewhere, dancing and getting into a trance is a way for devotees to get to a higher spiritual state and connect with their god. There were about 500 members there, mostly dressed in white gelabiyas (long robes) and they formed a large circle with higher order members in the middle drumming up the chants and getting the crowd revved up. The weekly event is open to all and I got into it, as well. The dancing motion involves slightly crouching forward and pumping your arms back and forth. The rhythms from the tambours (drums) and the zikir (chanting) were so intoxicating that my body had to join in. As the crowd was getting worked up into a frenzy, this man with the staff was parading inside the circle with an entourage in tow. I presume the color of their robes were significant with many men sporting green gelabiyas with black and red ascents. A Sufi elder walking through the crowd and blessing the devotees with incense. The event was highly entertaining and I enjoyed seeing the smiles on everyone around me. And what I especially liked was seeing women and men together, dancing and being free. 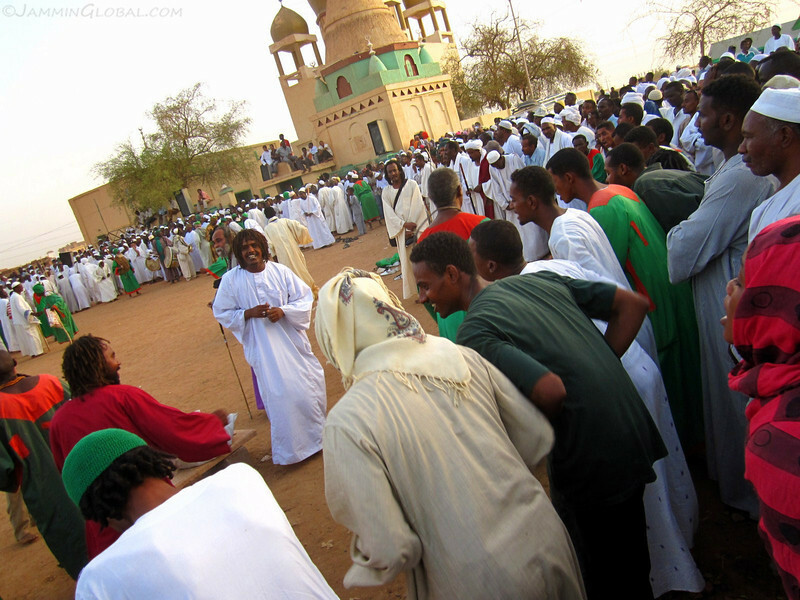 Sufi rituals are actually looked down upon by conservative Muslims for many reasons, one of them being that women are allowed to partake in the rituals alongside men. I’m all for gender equality. A short video of the buildup of the chanting from a slow, walking pace to a frenzied sprint. Do the motion when you watch it. Older women, younger women, children, men, all together enjoying a meditative state of mind. 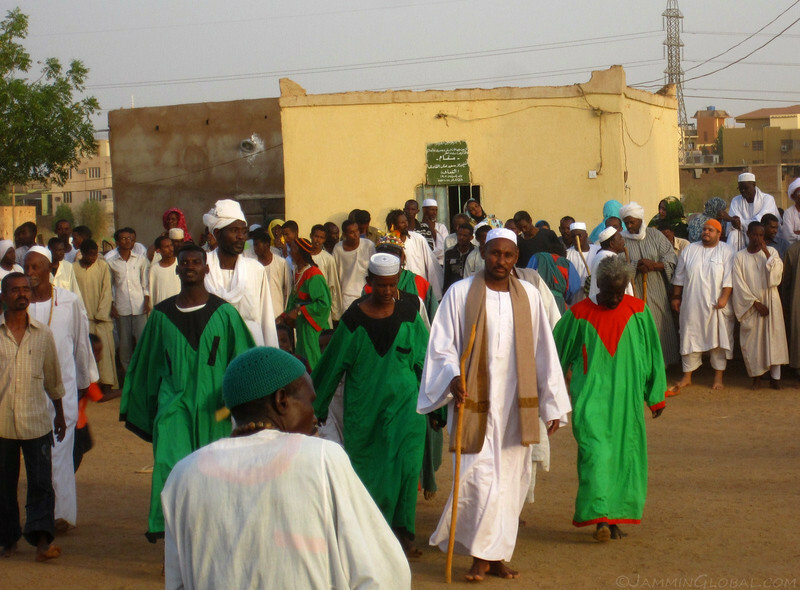 Sufism is very popular in Sudan with many different orders present and they say mainstream Islam was brought to the region after Sufism made it way over in the 16th century. But still, other Muslims don’t appreciate these kind of events taking place and just outside the cemetery were soap-box imams trying to encourage devotees not to participate and instead to follow mainstream Muslim practices such as praying at a mosque. Three Muslim girls with different-colored head scarves looking on just as the ritual reached its climax at sundown. After reaching spiritual ecstasy, the devotees spend time in prayer. I met up with Omer, who’s a local biker and meets all the bike travelers passing through his city. He took Tom and I to the Sufi event and showed us around the city. He studied as a veterinarian in South Africa and while his focus was on tropical animals, he’s now with the government and working on improving livestock (cattle, goats and chickens). 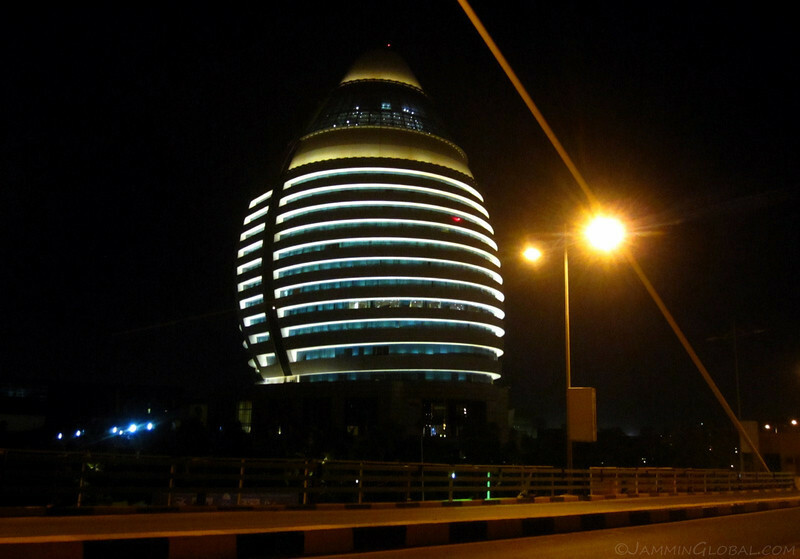 On a night tour of Khartoum and coming across the iconic Corinthia Hotel, dubbed as “Gaddafi’s Egg,” because it was funded by Libya. 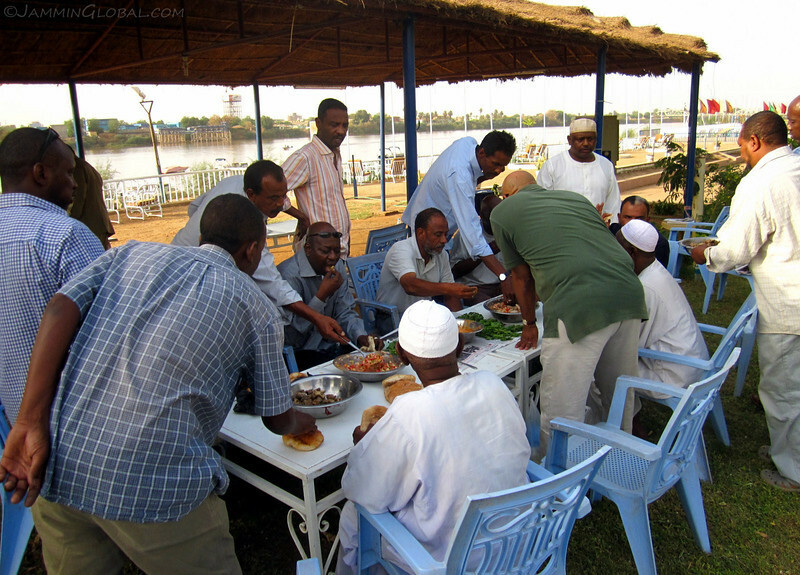 I spent a few days in the city, taking care of trip business and getting to know more of the local members of the Blue Nile Sailing Club. It was run by Osama (blue-striped shirt) and he invited me again to join them for a Saturday lunch of mutton. I placed my tent under that tree back there and enjoyed the tranquility of the place. 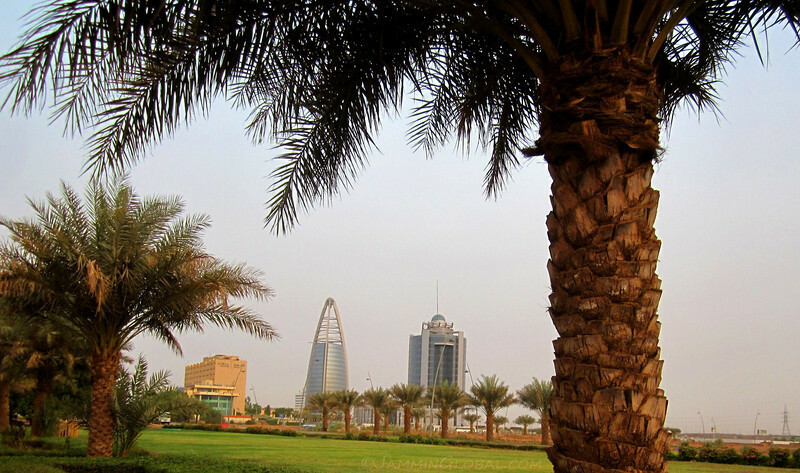 It was extremely hot during the days, reaching 50 C (122 F) in the afternoons and maybe dipping below 25 C (77 F) at night. As soon as I woke up, I had to down a liter of water before I could move. 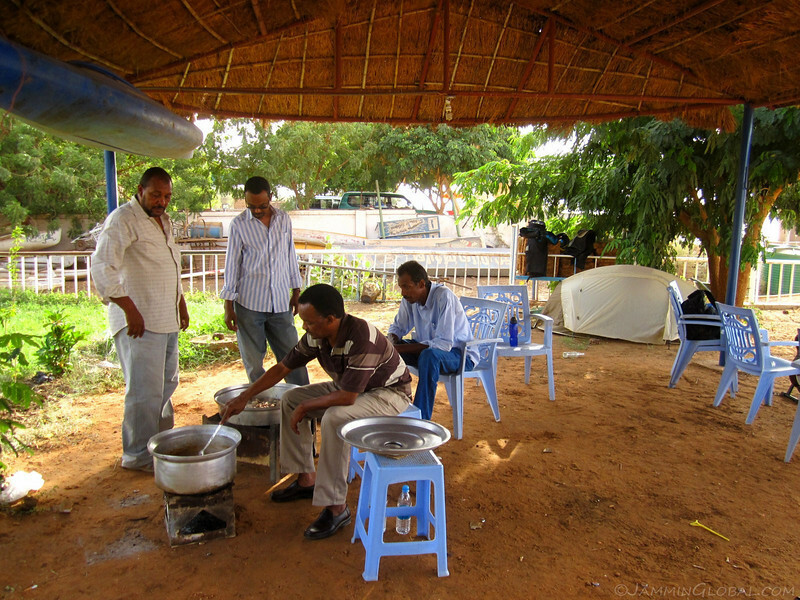 A tasty, spicy mutton stew brewing on the grounds of the Blue Nile Sailing Club. 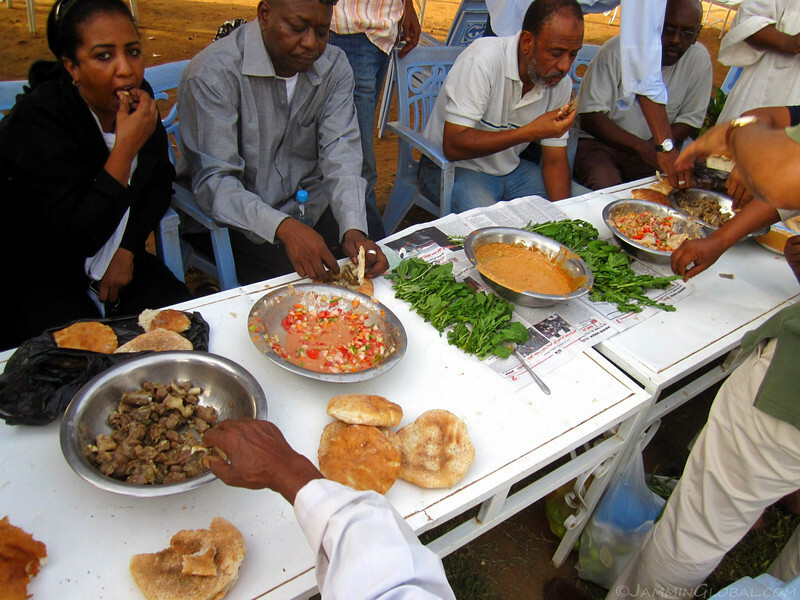 Communal eating is the preferred way food is consumed in Sudan and as soon as the food was placed on the tables, it was a free for all. Osama told me to put down the camera and get some grub before it disappeared but I had to capture the moment. Any efforts to spread the tenets of the Slow Food Movement would be futile here. A delicious spread of mutton, a salad of tomatoes and onions with a yoghurt sauce, some greens and fresh bread. 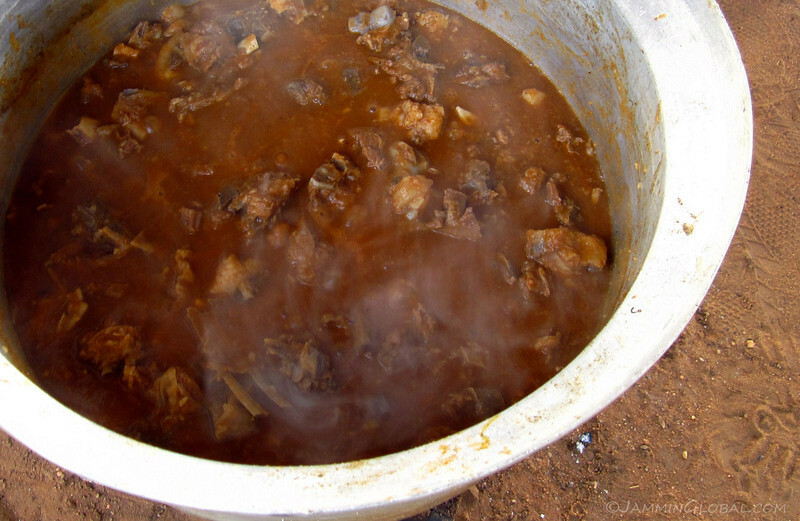 The mutton was still steaming hot but it was devoured in a few minutes. 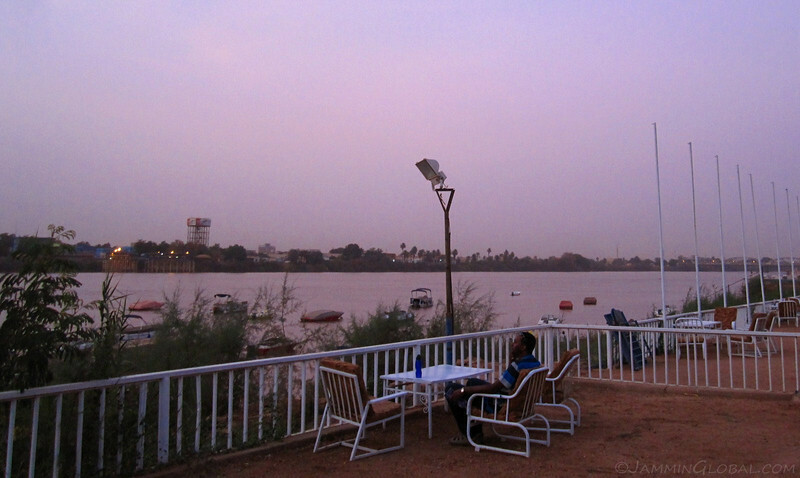 Omer would stop by after work and we chatted on the shores of the Blue Nile in Khartoum. 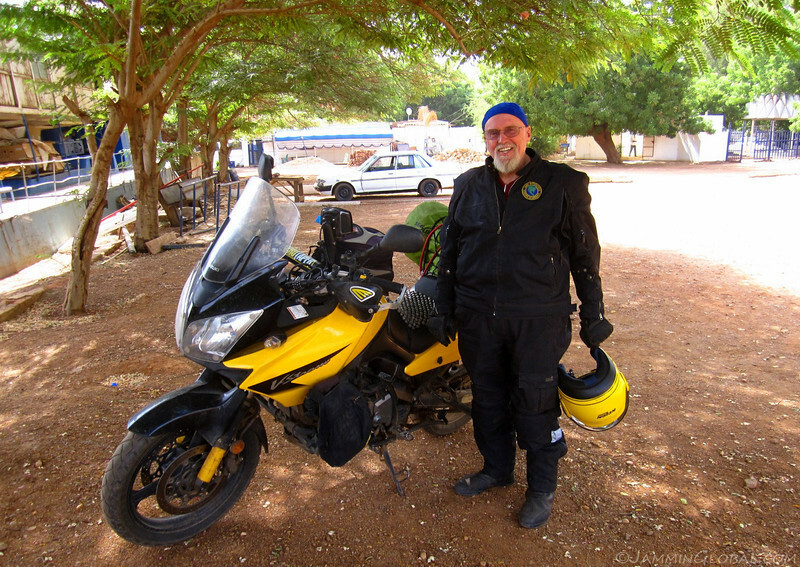 He’s riding a Suzuki GS500 now (one of the first bikes I had) but has dreams of getting some bigger to tour around Africa and thus had many questions for me on bike maintenance and necessary gear for traveling. The al-Mac Nimir Bridge connecting Khartoum with Khartoum North across the Blue Nile, which wasn’t actually blue due to lots of sediments that flow down from the Ethiopian highlands. 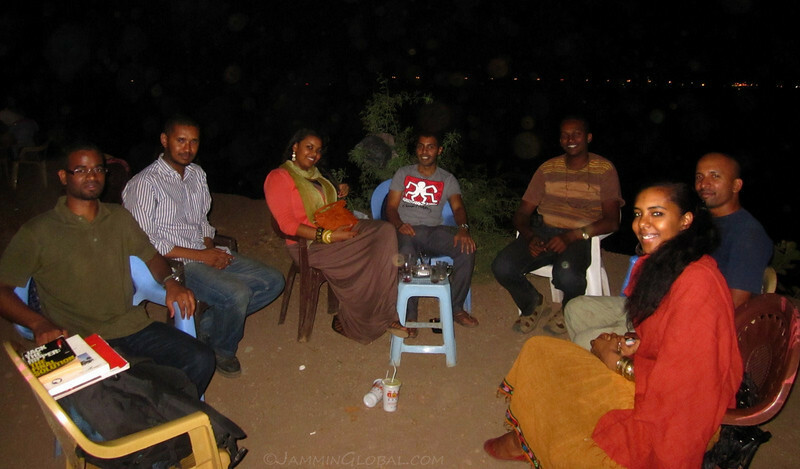 On one of the evenings, Omer took me to meet some of his friends who gather at this spot on the banks of the Blue Nile over some tea and shisha. They were all very friendly and I felt very much like I was back in India. Actually a couple of them thought I was Sudanese and I told them in return that they could all pass for Indians. And many of them actually did their university studies in India. There’s been a long-term bond between our two countries, which dates back to our common British overlords. The Brits actually brought over many Indians at the end of 19th century to help in infrastructure projects and they even dismantled a bridge in India and rebuilt it across the Blue Nile. I enjoyed the conversation and felt at home among my brown peoples. I secured my visa for Ethiopia and after doing an oil change and air filter cleaning on the bike, I made a quick tour to capture the feel of this modern city at the confluence of the Nile. 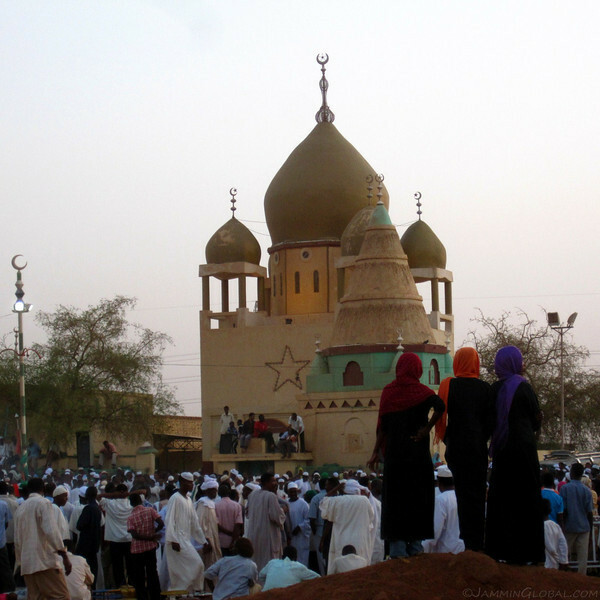 Taking photographs in public is not encouraged in Khartoum as the regime suspects that all foreigners are spies. So, I reverted to my FotoMotion technique of clicking away with my left hand while riding. 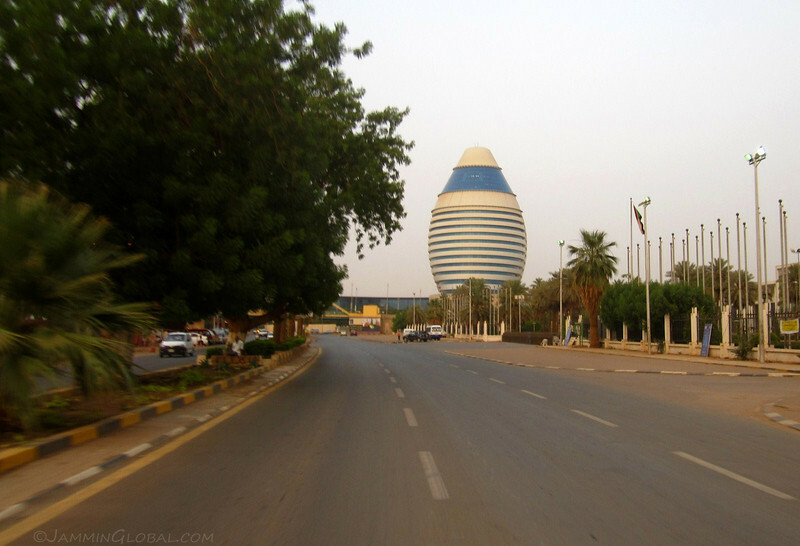 A pretty good shot of Gaddafi’s Egg, which stands out in the Khartoum skyline. The confluence of the White Nile as it meets the Blue Nile coming in from the right. There isn’t really a good place to capture this hydrological event, so I took this in motion from a bridge. They had security guards at either end of the bridge, so it wasn’t possible to stop for even a second. 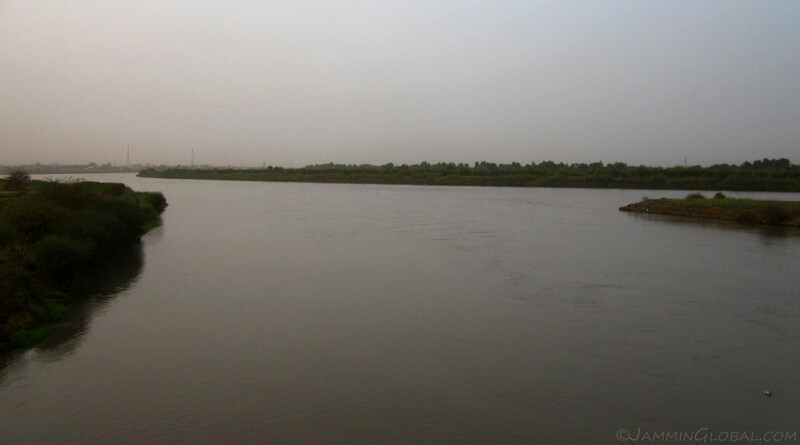 I was told by my father, who visited Khartoum about ten years ago, that it was possible to see the two tributaries actually mixing, but I think I was here in the wrong season and they were both quite muddy. The White Nile flows more slowly from Uganda and through South Sudan, while the Blue Nile comes from Ethiopia and is responsible for the rich sediments that Egypt used to depend on, before the Nile got dammed. 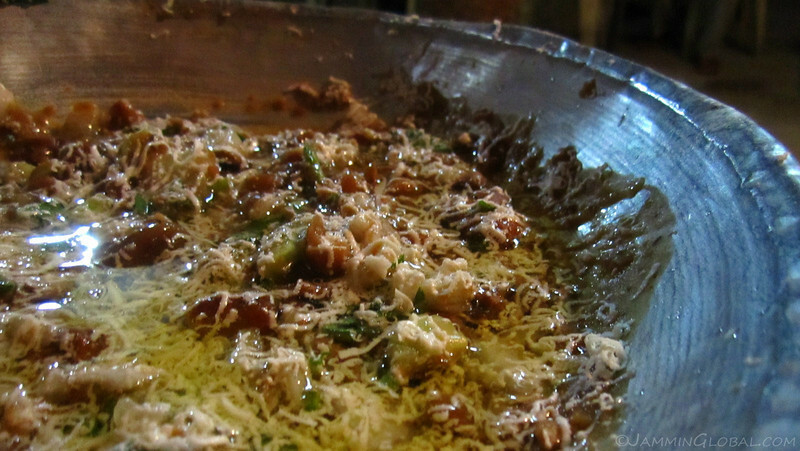 The staple food of Sudan and Egypt, a bowl of fuul served with a liberal dose of olive oil and grated cheese. A hearty helping like this cost SP 2 ($0.90). 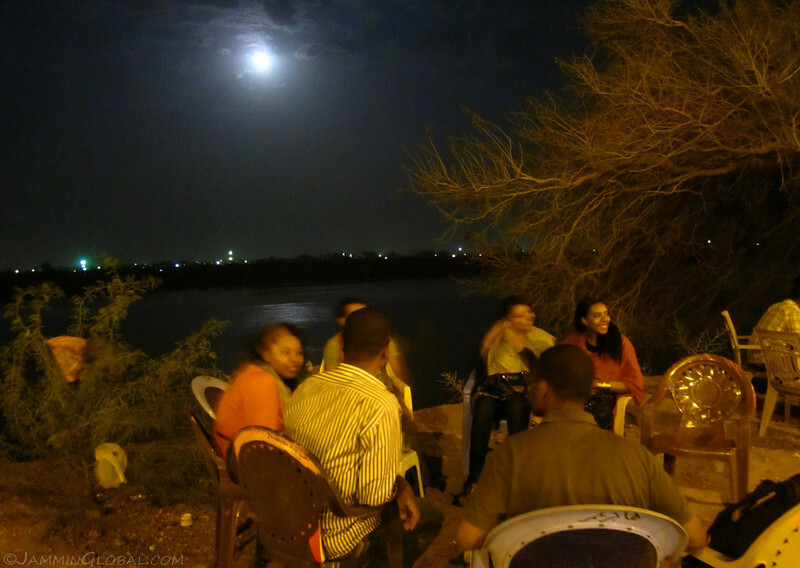 The grounds of the Blue Nile Sailing Club, who still welcome overlanders to camp, relax and get to know a bit of life in Khartoum. After four days here, I felt I got a quick overview of this developed, modern city, which stands at congruence with the rest of the country. There might be strict economic sanctions placed on Sudan, but life still goes on and the conversations I had with Omer’s friends told me that the younger generation is eager for a chance to be welcomed on the world stage. With the independence of South Sudan just a few days away and with the promise that sanctions might be lifted, their hopes seem attainable. I do not remember very many things from the inside out. I do not remember what it felt like to touch things, or how bathwater traveled over my skin. I did not like to be touched, but it was a strange dislike. I did not like to be touched because I craved it too much. I wanted to be held very tight so I would not break. Even now, when people lean down to touch me, or hug me, or put a hand on my shoulder, I hold my breath. I turn my face. I want to cry. 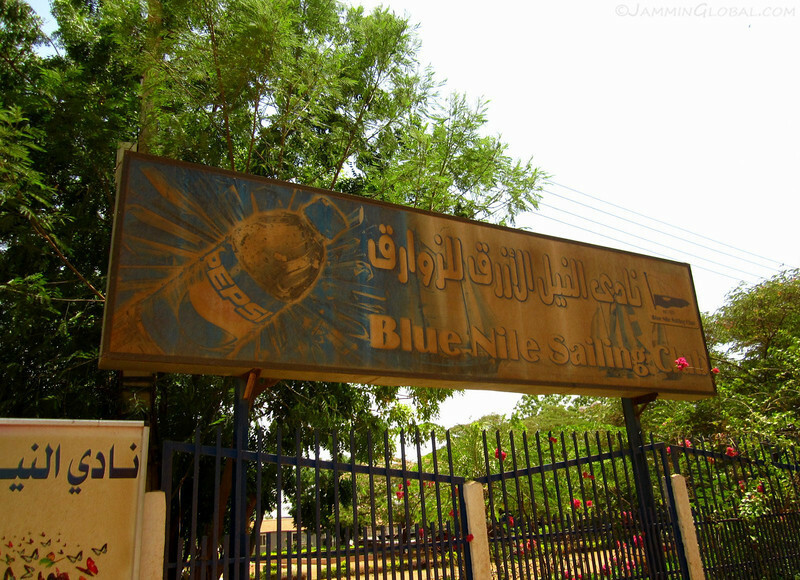 Oh, in February, 2010 at the end of my Egypt-Sudan cycling trip I stayed two weeks in the Blue Nile Sailing Club, waiting for a plane. 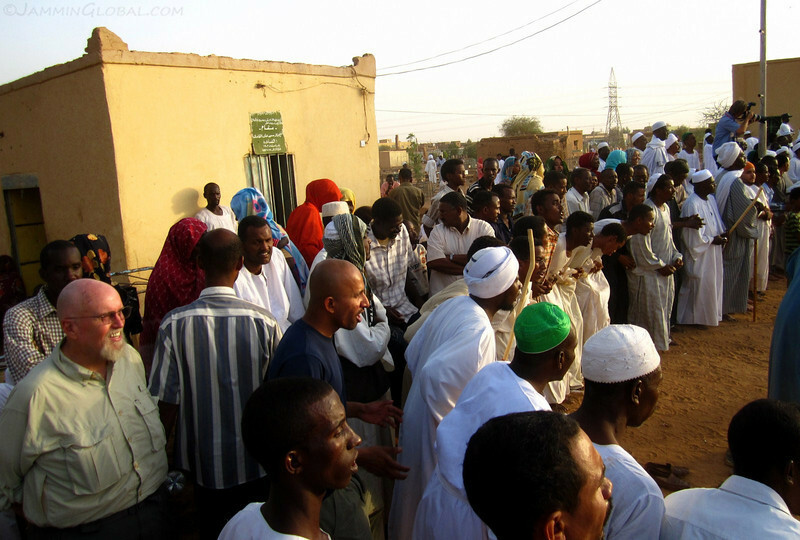 I had a great time in Khartoum. Nice to see the sites again.